OLD PARKED CARS. 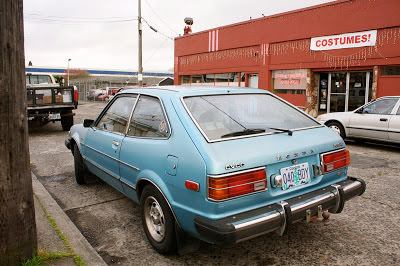 : 1979 Honda Accord CVCC hatchback. 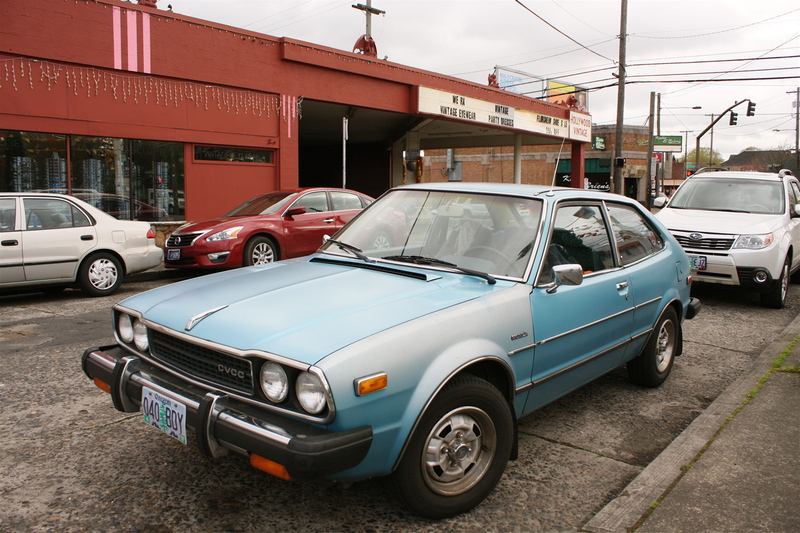 1979 Honda Accord CVCC hatchback. You used to see these all over the place in the 70's early 80's. College Campuses were thick with them. Nice to see one on the street again. Nice find. I´m pretty sure that´s a 1979 model. Don't confuse it with the Civic CVCC, Javier. Those are much smaller. Tony, it's definitely a '79 Accord. 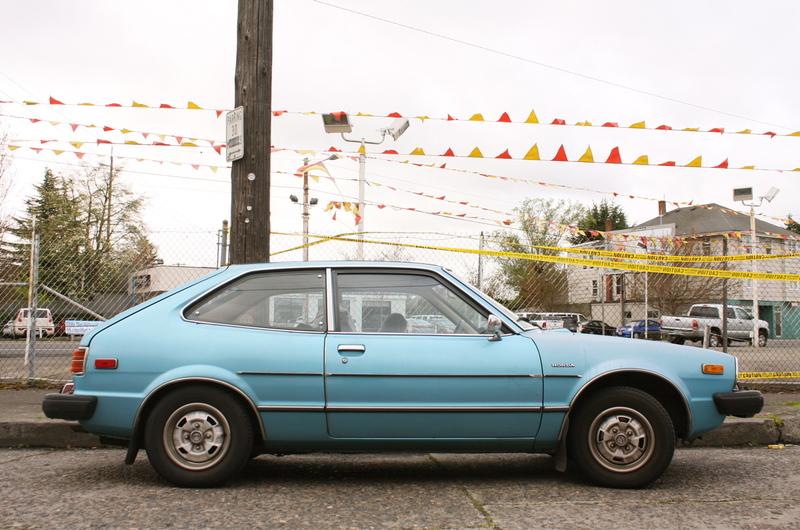 The wheels, grille and taillamps were all 1979-only items in the US. It's the final year Honda put CVCC badges on their cars, even though they continued to use the technology through '83 on the Civic. Looks the Honda dealer did the usual heavy sell on the accessories. The bumper guards, right side mirror, rear mud flaps and fender well trims are all genuine Honda add-ons. And it's a 5-speed...nice! thanks, dudes. i've corrected the post title. Love this gen of Accords....although, the CVCC system is hell. Those pictures of the diagram i've seem....holy crap. My cousin had a car that was identical to this one, right down to the paint. It was a sweet car and I don't know if I've seen another one like it on the road. Awesome that a car this old is still running and in such good shape. I've always liked Hondas. Had a 81 Accord CVCC my 1st car. Man memories, but they are mostly bad. Pale Green with Rust everywhere, burned the clutch out in first month, the cheesy rear doorlock pull switch. 0 to 60 in 2 minutes. Just surprised all these have not rusted into the ground by now. 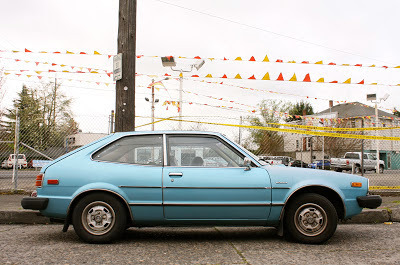 My folks had a '78 that was a great car, even with the two-speed Hondamatic. I had a 1980 sedan, sold it in February, formerly in burgandy but faded to a pink champagne. The paint on these cars, no matter the color, looks better after 30+ years. It was slow and saddled with a slushbox, but not bad for $1. My first car. 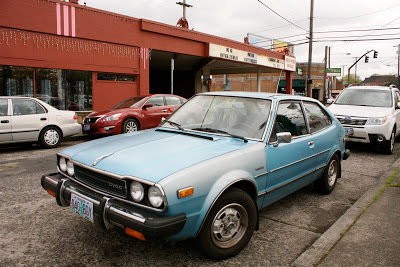 In 1984 I was 18 and I bought a blue 1979 hatchback just like this one from a friend's dad for $3200. It had just 35,000 miles on it and I put another 85,000 on it. Got me through college plus multiple trips to Chicago, all over MI and a road trip to NH/ME/MA. Loved that car. I bought the same car when I got back from overseas in Oct 83. Only difference is mine was gray. Paid 4K. Drove it cross country 4 times. Started with 40K miles. Had 155K on it, it was in great shape (engine, body, transmission) and was planning on using it for at least 10 years and 200K more miles. That's when a drunk ran a red light, T-boned me doing between 60 - 70 at intersection where I was waiting to turn left, and I walked away without a scratch. Best Car I ever owned!!!! Recently picked up a silver 79 5-speed LX hatch. Everything works except the digital clock. A little rough looking (original everything) but so fun to drive and really takes me back to the light Japanese and German cars I owned back in the 70s and 80s.